A dual fuel inverter generator offers you best of both worlds. A portable generator is, in itself, valuable. For backup power during a power outage, camping, on a jobsite, a farm, or for off-grid living, countless people rely on generator power. When you add the versatility of dual fuel operation to the equation, it becomes all the more beneficial. You can use either gas or propane as a fuel source. I’ll discuss the pros and cons of propane vs gas generators later in the article, after reviewing the products. If you then consider the benefits of clean, low HD inverter power to this, already versatile, portable generator, you have a winning combination. If you need to know more about inverter generators, I’ll also provide more details on the topic after the review. Because this is not a common combination, both dual fuel and an inverter, your choices are limited. There are several generator manufacturers who have embraced dual fuel technology. Just as many utilize inverter technology. Though few do both. Even then, the models aren’t as comprehensive. So you need to do some research if you’re looking for the best dual fuel generator that has the wattage output you’re looking for. If you’re in the market for a small to mid-sized portable dual fuel inverter generator (3500W – 4500W), we’ve done our homework and have two excellent options for you to choose from: the Westinghouse iGen4500DF, with a peak output of 4500W, and the Champion 100263, which has a lower peak output of 3400W. Because these two generators cost roughly the same, my first choice would be the Westinghouse iGen4500DF. It’s the more powerful of the two, which makes it better value. Though this is my opinion, not everyone will agree. Only after reading the review of these two dual fuel generators, will you be able to decide which is going to be the best for you. When it comes to price, these are both very reasonably priced models in the greater scheme of things. Inverter generators are always more expensive than standard models. Dual fuel also comes at a slight premium. So one would expect any generator that offers both of these advantages to be outrageously expensive. In this regard, neither the Westinghouse iGen4500DF, nor the Champion 100263 are all that expensive. In addition to the points I’ve mentioned, both are quiet generators with a sound insulating enclosure. So they will never be as noisy as open frame generators. Champion 100263 | How does it Compare to the iGen4500DF? So it goes without saying that both generators tick all the boxes. As far as affordable, dual fuel inverter generators go, you won’t easily find a better deal. By comparing them side by side, you’ll know what sets them apart. It’s about buying with confidence and this is my aim for the review. Present you with the facts and leave you to decide which is the best dual fuel inverter generator. Best Dual-Fuel Inverter Generator for the money. Can power air conditioners up to 15,000 BTU. ✓ Also available as a straight gas portable generator : Read our review of the Westinghouse iGen4500. Remote start, operated by a key fob. You can start it from inside your home or RV. Can easily handle air conditioners up to 15,000 BTU and everything else in your RV. Telescoping handle with rear wheels making it easy to move. Clean power allowing safe operation of sensitive electronics such as computers, televisions, tablets, and mobile phones. LED panel shows : Remaining Run Time, Power Output, Fuel Level, Voltage, and Lifetime Hours. Additional Indicators : Fuel Level, Electric Output, Output Ready Indicator, Overload Indicator, and Low Oil Indicator. Outlets : One 5-20R 120V Household Duplex Receptacle, and One TT-30R RV Receptacle. Runs up to 18 hrs on a full tank of gas. Runs up to 14 hours on a 20 lb tank of propane (LPG). Whisper Quiet – as low as 52 dBA. Less Noise than a Normal Conversation. The iGen4500DF Dual Fuel inverter generator won’t bother your neighbors. Perfect for camping, tailgating and emergencies. Includes wheels and telescoping handle. Dual USB Charging Ports : Charge your personal devices such as : Smartphones, tablet, and Kindle, etc. 3-Year Limited Warranty : All Westinghouse Portable Generators come with a 3-Year Limited Residential Warranty and Lifetime Technical Support. 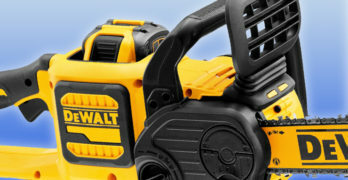 Includes : Propane Hose, Remote Start Key Fob, Battery, Charger, Oil, Funnel, Tool Kit, Manual, and Quick Start Guide. As much as I want to provide a purely objective review of these two dual fuel inverter generators, I have to admit from the offset, that I’m a huge fan of the Westinghouse brand. Even though their generators can compete with the more expensive brands, they don’t cost all that much. It’s hard to argue with that kind of value for money combination. None the less, compare the stats and specs, and see whether you agree with this. Like most modern inverter generators, the Westinghouse iGen4500DF is a compact, lightweight inverter in a very sleek enclosed body. It weighs 98-pounds which, for a 4500W generator, isn’t heavy at all. Conveniently placed handles, and a wheel kit, certainly make it a very portable generator. I like the telescopic front handle, this makes it exceptionally easy to lug around. Though, like all similar enclosed inverter generators, it’s not built for moving across rough terrain. Small plastic wheels glide easily on a paved surface, but won’t fare too well on gravel. The power output is ideal for the RV owner and I would think that this is the main target market for this generator. With 3700W continuous running power and a peak (surge) output of 4500W, you can run most RV air conditioners with enough power to spare for all your basic camping power needs. As a basic power backup generator for home use during an outage, the iGen4500DF is quite up to the task. You’ll be able to power your refrigerator and quite a few other appliances, as well as all your lights. Power output, when using propane, is always lower for any dual fuel generator. In the case of the iGen4500DF, you’re looking at 4050 peak watts and 3330 running watts. This is roughly a 10% variation between the performances for gas vs propane and is within the normal range for a dual fuel generator. When I discuss the pros and cons of gas vs propane, I’ll explain the reason for this difference in the wattage when using the two different types of fuel. The befit of an inverter speaks for itself. None of your sensitive electronic equipment will be harmed by high THD levels. Even when you push this generator to its limits, the power output will remain stable and safe. According the specs provided, THD is less than 3%. This is in line with international best practices for inverters used for domestic and commercial purposes. Parallel connection ports are a common feature on most inverter generators, this allows you to connect two generators of the same type in parallel, doubling your power output. The Westinghouse iGen4500DF is no different in this regard. You can purchase the parallel kit as an optional extra. The 224cc, 4-stroke engine has quite a few benefits. It is a fuel efficient, clean burning power plant, meeting CARB, EPA, and Canadian requirements for safe emissions (CSA). It has an electric starter and a recoil starter for those times when the battery runs low. It also has an automatic choke for simpler starting. A great plus is the wireless remote control, which can be a real convenience in bad weather. Who wants to venture out into the cold and rain or snow to start their generator? Like most inverter generators, it has a variable engine speed. So when the power demand is high, it will run at the required 3600 RPM. In the economy, or silent mode, the iGen4500DF will reduce the engine speed when the power demand is low (around 25% or less of the total output). This reduces the noise levels to a barely audible 52dBA and saves on fuel, as well as reducing wear on the engine. I take fuel consumption as an important aspect when reviewing a generator, this is a cost that you’ll have to deal with for its lifetime. Here, I find the iGen4500DF to be pretty average for this type of generator. It has a reasonably sized, 3.4-gallon gas tank. I’m happy to report that this is a durable, steel tank. When running at 25% load, the rated runtime is 18-hours on a tank of gas. I’m assuming that this is with the economy mode engaged. This works out at 4.9 kilowatt-hours per gallon. The Westinghouse iGen4500DF has a fantastic user panel. It’s perfectly positioned for easy access and has a bunch of user-friendly features. I’m going to start with digital display, something that doesn’t usually make a big difference to me. Sure, it’s handy to check your voltage and frequency to know that everything’s working fine. But how many people actually take note of this? The iGen4500DF does give you the option of a voltage readout, but offers a lot more than just this. You have information that makes a big difference to the daily use of the generator. The numeric digital display is flanked on either side by a digital fuel gauge and an output percentage display. These are easy to check at a glance and give a good estimate of the fuel level (full, three-quarters, half, quarter, or empty). Similar LED indicators show the percentage of available watts that you’re consuming, 25%, 50%, 75%, or 100%. If you want a more precise reading of your fuel level, you can toggle through the numeric display options and check the fuel level in liters, to within one decimal point. It also has a digital readout for hours remaining. This gives you the estimated runtime left before the gas tank reaches empty. You can also check your exact power usage in watts, to within two decimal points, and the total running hours, so that you log your service intervals. That’s a digital data center that actually makes sense – providing you with useful information. The outlets are perfect for the size of this generator. It doesn’t have the large 50A outlet that one would use for a transfer switch. It doesn’t need one, the maximum peak current is 37.5A. The normal running power will never exceed 30.8A. So the 30A, RV-style (TT-30R) is exactly what one wants. It also has duplex 120V 20A (5-20R) outlets, and 2 X 5V USB outlets and a handy battery charger port. This is not used to charge external batteries when the generator is running, like most 12V DC battery charging ports. It allows you to charge the onboard battery, using a battery charger, when the generator is not in use. All the electrical outlets have protective plastic covers – something I greatly appreciate. The duplex outlet is protected by a 20A circuit breaker, the larger RV outlet has a 30A breaker and there’s a main protection breaker. These are all of the push to reset type breakers. The Propane inlet is conveniently placed on the front panel, with a fuel selector switch directly next to it. This keeps everything logical, simple, and easy. There are indicator lights for output ready, overload, and low oil (the engine will also cut out if the oil is too low). A simple switch allows you to select Efficiency Mode, this controls the RPM relative to the load requirement to maximize fuel efficiency and reduce noise levels. The Westinghouse iGen4500DF has absolutely everything I’d look for in a 4500W generator and much more. It is, in my opinion, the best dual fuel inverter generator in the 4500W class. Despite being very reasonably priced, the iGen4500DF is packed with great user features and is of a quality standard that I’d expect only to find on much more expensive generators. 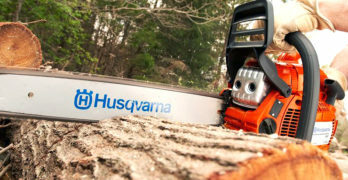 The warranty is certainly on a par with the high-end machines: 3-years for residential use and 1-year for commercial use. Read more reviews about Westinghouse generators or visit the Westinghouse site to learn more about the brand. ✓ View or download the MANUAL for the Champion 100263. I’ve already made my position clear, I feel that the Westinghouse iGen4500DF is the best dual fuel inverter generator in its class. 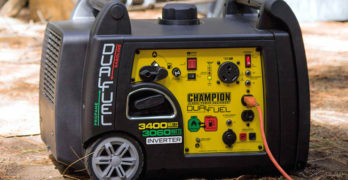 Though, if you take a look at all the customer reviews that rate the Champion 100263 as a really fantastic dual fuel inverter generator, it cannot be overlooked. They have many similarities. Both are quiet, hybrid generators with the advantages of an inverter. So the Champion 100263 will also provide pure sine wave, low HD power which is safe for electronic equipment. It also has the option of a parallel kit, so you can use more than one champion inverter generator simultaneously, thereby increasing your power output. There are a few reasons why I feel the Champion doesn’t quite match up to the Westinghouse. Firstly, the Champion doesn’t produce the same wattage. Running on gas, the Champion 100263 provides a constant 3100W running power and a peak startup current of 3400W. As is to be expected, the power output when using propane is somewhat lower (2790 running watts and 3060 starting watts). This makes it an entry level RV dual fuel inverter generator. You should be able to run most RV air conditioners, if you’re using gas, but won’t be able to use as many additional appliance as you could if you were using the Westinghouse iGen4500DF. Using propane, you may even find yourself limited as to what AC you’re able to use. This would be the most notable difference between the two generators. I also prefer the Westinghouse because it has a remote control. The champion only has a recoil and electric starter, which is still better than only having a recoil starter. The choke is manual, but this doesn’t make much difference. It is an easy generator to start and use. The Champion 100263 does not have plastic covers for the outlets. Although, this too, is a minor issue. Though personally, I really like covered outlets. They protect them from dirt and moisture, which means they are susceptible to wear and damage. So these are the more basic reasons why I prefer the Westinghouse iGen4500DF when compared to the Champion 100263. Though there is another, very important reason why many may not prefer the Champion 100263. This would be fuel economy. The Champion has a smaller 192cc 4-stroke engine. Like the Westinghouse, it has an economy mode, allowing the engine to run at a lower RPM when the power demand isn’t too high. This engine also has low emissions and is both CARB and EPA certified. Though, when we compare their fuel consumption, the Champion is not that great. This means higher running costs. The Champion has a really small gas tank, only 1.6 gallons. This provides 7.5 hours runtime at 25% load. Because these generators don’t have the same output in watts, and the size of the gas tank differs greatly. It’s not easy to make a real assessment as to what you’re actually paying for gas. That’s why I like to calculate the kilowatt-hours per gallon (KWH/G) rate for each generator. This provides the same type of comparison as you would make with a car when looking at their miles per gallon stats. The more miles you get per gallon of gas the better your savings. Similarly, the more kilowatt hours you get from a gallon of gas, the more economical a generator is to use. Calculating the KWH/G rate for these two generators, using the specified hours at 25% load, gives a definitive answer as to which one gives the most power per gallon of gas. The Champion 100263 has a fuel consumption rate of 3.6 KWH/G. When compared to 4.9 KWH/G for the Westinghouse iGen4500DF, this figure is a little disappointing. The Westinghouse is about 25% more fuel efficient. Okay, so far the Champion 100263 isn’t faring too well when compared to the Westinghouse iGen4500DF. So does the Champion have any redeeming features? Well, it is a little lighter, if only by a small margin. The Champion weighs 95.7 pounds, a little under 3-pounds lighter than the Westinghouse. That’s not enough to sway my opinion as to which of these generators is the best. The Champion has similar wheels and really great handles at the top, this should make it a little more comfortable to lift. As for the rest, there isn’t much to separate the two. The Champion has the same 120V outlets: 2 X 20A household power outlets and a 30A RV-style 120V outlet. It doesn’t have USB ports, but does have a 12V DC battery charging outlet. The circuit breakers are the same and the Champion is also protected by low oil shut off. Noise levels are about the same. At low revs, the Champion has a noise reading of 59dBA. The Champion also has a convenient propane/gas fuel selector on the front panel and a propane inlet that’s easy to access. I’m sure there are many who are loyal to the Champion brand and that would count for something. Westinghouse has not been in the retail generator market very long and this would be my only real concern when buying a Westinghouse generator. If you need dealership service or spare parts, it’s going be a lot easier to find these for the Champion generator. This is an established brand. So, even though the Westinghouse has the technical specifications to beat the Champion. The latter may win on a purely practical level. After sales service is going to be much easier to find. 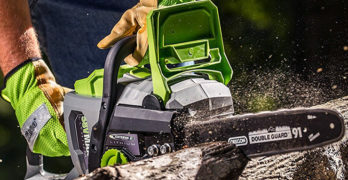 I think that the general quality of the Champion 100263 cannot be disputed and it also has a 3-year warranty. So, depending on your priorities, both the Westinghouse iGen4500DF and the Champion 100263 have their merits, making these two dual-fuel inverter generators among the best dual fuel inverter generators and certainly great value for money. Learn more about the Champion brand by visiting their site. Modern electric appliances usually have electronic controls and may also have computerized CPU. In the past, we may have only thought of computers, TVs, and stereos as being electronic appliances. Though just about everything from washing machines to microwaves, even many vacuum cleaners, now make use of electronics. If it has a screen, digital numeric display, or touch pad controls, it utilizes electronics. This is why inverter generators have become so important. You may have heard of Total Harmonic Distortion (THD) and how it can harm sensitive electronic circuits. But how many people actually know what THD is, and how an inverter prevents this. This is what I’m going to explain in this section of the article. Alternating current (AC) moves in waves, in exactly the same way as sound does. This is known as a sine wave, with an amplitude (voltage) and a frequency (Hz). If a generator is designed to produce 120V at 60Hz, it has to maintain this on a constant basis. This is done by controlling the engine RPM. Generators usually run at a constant 3300 or 3600 RPM. The alternator spins at the same speed. They may often use an Automatic Voltage Regulator to prevent a voltage spike. In other words, a short period where the voltage reaches a high level. However, this does little to control the harmonic distortion. If the frequency or voltage changes, even slightly, the sine wave becomes distorted. Instead of resembling a smooth curve, it has sharp spikes in it. In order to understand how precisely a sine wave needs to be controlled, you need to take the AC frequency into account. In the US, this is 60Hz, meaning that there is an electron pulse 60 times every second. So to maintain this, the current has to have split second timing. An electronic device, like an inverter can react fast enough. But a mechanical device, like a generator, can’t. The generator uses gas to fuel the engine and this passes through a carburetor that has a throttle to control the flow as gas. As more energy is required at the electrical outlets, so more gas has to be combusted by the engine. When you switch on an appliance, the electricity is supplied within one sixtieth of a second (0.1 seconds). The reaction of the generator throttle and the flow of gas to the engine takes about a second or more. During this time, the engine is not getting enough fuel to maintain the constant RPM and the voltage and/or frequency will be erratic. You can hear the engine pitch change for a short period, every time the load changes. This causes Harmonic Distortion (HD). Total Harmonic Distortion (THD) is the sine wave distortion measured over any continuous time period. A generator that does not use an inverter can have THD readings as high as 25%, sometimes more. The closer a generator is to its maximum power output, the higher the THD will be. To ensure that electronic circuits function correctly, the recommended THD level is less than 5%. Most inverter generators have a THD rating of less than 3%. This means that even when the generator is running at its maximum peak load, the THD will never exceed 3%. The inverter achieves this by using transistors and capacitors to create an AC sine wave from a direct current (DC). This is monitored by a Central Processing Unit (CPU). It monitors the current entering the inverter and the load required, as well as the output voltage and frequency. Any variations in these factors are immediately detected by the onboard computer and is adjusted within 0.1 second. So the frequency and voltage remains constant, regardless of external factors. Of course, less than 3% THD does mean that it is not 100% perfect. When a generator reaches peak load, there may be a slight distortion of the sine wave. But this is not enough to harm electronic circuits. Hybrid, or dual fuel generators are designed to run on both gasoline and propane (LPG). This is not to be confused with natural gas. Although propane and natural gas are very similar, they do not have the same combustion properties. A generator that can run on propane, cannot use natural gas as a substitute. Some large standby generators use natural gas. 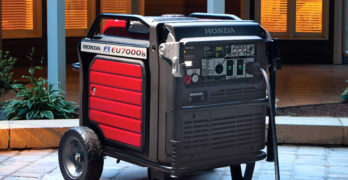 Though portable dual fuel generators can only use gas or propane. The main benefit to using propane is that it burns cleaner with lower emissions. This has obvious environmental benefits, but it also affects the maintenance and life of the engine. Propane burns almost entirely free of carbon and other harmful elements. This results in lower levels of contaminants in the carburetor, combustion chamber and, ultimately, the exhaust gasses. The carburetor will not experience the same residue buildup as it does with gas, nor will the spark plug. Abrasive elements that remain when gas is burnt, are not present when using propane. This means that there is less wear on the cylinder wall, valves and combustion chamber. An engine that runs on propane will, therefore, last longer. The benefit of using a dual fuel generator, instead of one that runs on only gas or propane, is the versatility that it offers. In some areas gas may be cheaper, and it is often more readily available. So the cost and availability may be a deciding factor as to which fuel will be the preferable option. Furthermore, there may external factors affecting the availability of one fuel type vs another. When a hurricane, snowstorm, or earthquake is pending, people may flock to gas stations to stock up on emergency supplies. This often results in the supply running out and it may difficult for supply trucks to reach these gas stations when the roads are obstructed as a result of the natural disaster. This is a compelling reason why many prefer propane as an emergency fuel supply for their generators. Propane can also be stored indefinitely. Whereas gas has a limited shelf life. Propane can be used for other purposes as well, like heating and cooking. So it is a more versatile fuel, making it beneficial to store in larger quantities for emergency and off-grid use. There are safety considerations that need to be adhered to when using or storing either gas or propane. But most feel that propane is the safer option. This is generally because no flammable fumes are released into the surrounding atmosphere. The only real downside to using propane is that it has a lower calorific value than gas. This means that propane does not provide as much energy, which results in a lower power output from the engine. Less power from the engine, results in less kilowatts at the electric outlets. Generally, a generator will produce around 10% less power when using propane compared to the same engine running on gas.